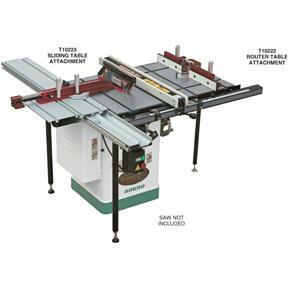 Accessorize your Cabinet Table Saw with this Router Extension Table for the ultimate in table saw functionality. 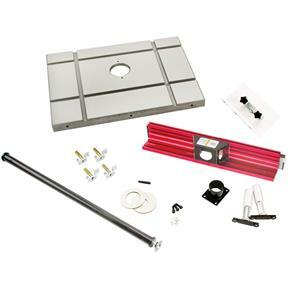 The cast iron Router Table Attachment with its universal router mount includes an anodized fence for straight routing and a starting pin for contour shaping. Easy installation. Fits most table saws with 27" deep tables. 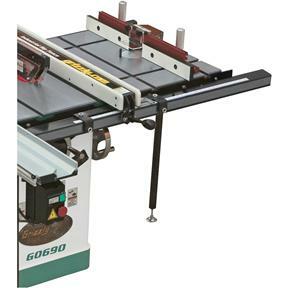 Table T-slots 3/4" x 3/4"
Fence size (x 2): 12-1/2" x 2-3/4" x 5/8"
NOTICE: Installation usually requires permanent modification to your table saw or its parts. 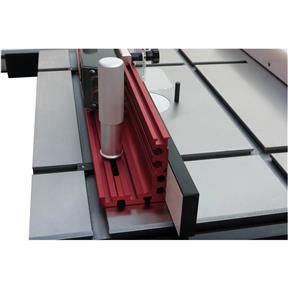 This modification may include cutting, grinding, drilling, and tapping threads in metal surfaces. Please read the Owner's Manual available online. Product itself is great, I was however; disappointed that the table had a slight ding on working surface due to shipping. The packaging should be beefed up a bit. 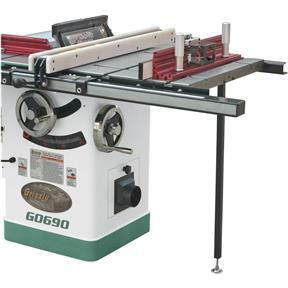 I have a shop full of grizzly products, table saw, 3HP shaper, planer, drill press, drum sander, joiner, power feeder, porter cable dovetail jig, router table and a lot of odds and end tool. I have never had any problems and just wish I lived closer to the store in Springfield. I drove 8 hours to buy all their products, worth the trip. Love the videos too! I have had this saw extension for years with a 3.25 horse router Porter Cable Router and I have worked it hard. It has not moved and it is very reliable and it is what you would expect from a router extension. I have put after market router lift on it and that made a work of differences. I use to go under the table for adjusting the height and that got old quickly. Previously I had a bench top router table which would move around. I now have this mounted to my table saw, with the mobile base and mobile base extension. It is rock solid, and doesn't budge when routing. The fence is top quality. Extremely glad I finally got this.